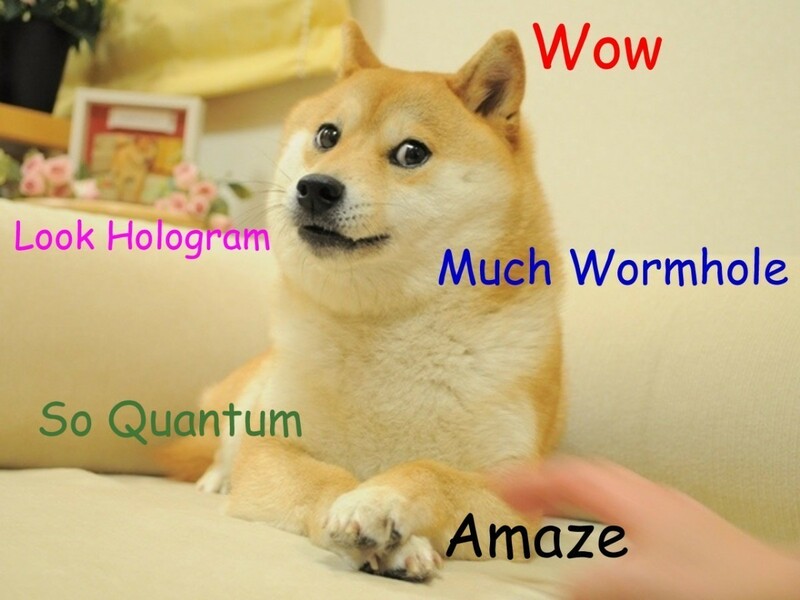 Wormholes, Entanglement and Holograms, Oh My! You may have heard about how quantum particles are wormholes, or holographic somethings. Whatever. It’s quantum wormhole things that, well, do something. So what’s all the hype really about? It all stems from a recent paper in Physical Review Letters (paywalled, but arxiv to the rescue) dealing with entangled particles and their connection of their holographic duals to wormhole geometries. So let’s start with a little background. Entanglement is a well-known property of quantum mechanics. It is perhaps most famously demonstrated through the Einstein-Podolsky-Rosen (EPR) experiment. Suppose we have a mischievous mutual friend. She decides to prank us by sending sending each of us one member of a pair of gloves. She packs each glove in a box and mails one to each of us. We find out about the prank, so we both know that we’re getting one glove of a pair. But until either of us open our respective box, neither of us know which glove we have. Once the box arrives at your door, you open it up, and find you have the left glove. At that moment you know I must have the right glove. This is the basic idea of the EPR experiment. For gloves it isn’t a big deal, because from the get-go the left glove was heading your way. You just didn’t know you were getting the left glove. That’s because gloves are not quantum things. In the quantum regime, things get much more strange. In quantum theory, things can be in an indefinite state until you observe them. It would be as if our boxes contained a pair of something (gloves, shoes, salt and pepper shakers, etc.) but it is impossible to know what specific something until one of us opens their box. In quantum theory we would say the boxes contain a superposition of possible things, and the outcome only becomes definite when the outcome is observed. Now even though you can’t know what specific object you have, you know that I must have its pair. So if you open the box to find a red right shoe, you know immediately that I must have a red left shoe. We both know this without opening the box, so we can say that the outcomes of opening our boxes are entangled. Knowing the contents of one box tells us the contents of the other. We’ve actually done this experiment with photons, atoms and the like, and it really works. Of course this is really hard to wrap your head around. If I’m thousands of miles away from you, and I open my box to find a salt shaker, I know you must have a pepper shaker. But your box couldn’t have known that until I opened the box. How is that possible? How can the opening of my box instantly affect your box thousands of miles away? Do the boxes communicate faster than light? (No.) Is there some secret (hidden variable) so that the boxes know what they will become when observed? (No.) That is part of what makes entanglement so strange, and the EPR experiment so popular. The one thing we can say is that entanglement is a very real physical effect in quantum mechanics. There isn’t anything magical going on, just something we humans find strange. Wormholes come from general relativity. Unlike entanglement, there is no experimental evidence for wormholes. Instead, they are a hypothetical connection between two locations in space. Normally when people think of wormholes, they think of something out of science fiction where people use wormholes to travel to distant stars, but the hypothetical wormholes in general relativity aren’t traversible, nor do they have to be large. This particular paper is looking at how there might be a connection between wormholes and quantum particles. This idea isn’t new, in fact the idea that fundamental particles could be wormholes dates back to the 1950s, when John Wheeler proposed a model known as geometrodynamics, where everything was empty space and charged particles were the mouths of wormholes. Wheeler was an excellent physicist known for coming up with a lot of wild ideas, some of which worked, and some of which didn’t. In the case of geometrodynamics, it never really worked, and after a while interest faded. But with the rise of string theory, different versions of the idea have gained some popularity. Hence this new paper. What the authors did was to look at a specific case of the EPR experiment, dealing with two quark particles. 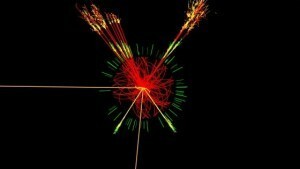 What they were able to show is that the entangled quarks can be described in two ways. The first is the standard way in which entanglement is described in quantum theory, but the second (dual) way is as two particles connected by a wormhole. Both of these descriptions are equivalent. Does this mean that entangled particles are wormholes? No. What it means is that there is an interesting connection between the mathematics of entanglement and the mathematics of quantum wormholes. Just to be clear, this has nothing to do with any new experimental evidence. But it is interesting, because it shows a connection between quantum entanglement and general relativity, and that may lead the way toward a better understanding of quantum gravity.